Driving Lessons Edmonton - Find driving Lessons in Edmonton of high premium quality with our team of expert driving instructors in Edmonton and in surrounding North London areas. Try driving lessons in Edmonton with your number one driving school in Edmonton: A Class Learners. Are you searching for driving lessons in Edmonton? Then look no further, we can help with your driving lessons in Edmonton. Are you looking for competitive prices for expert driving lessons in edmonton? Or, are you searching for a reliable driving school for driving Lessons in N9? Do you want to pass your practical driving test first time? Or, do you keep failing your driving test with your current driving instructor in Edmonton? If the answer is 'Yes' to the above questions then you have come to the right website for you. Try driving lessons in Edmonton and get our professional opinion as to what standard your driving is currently at. Learn to drive with our driving school in Edmonton and see an improved difference to your driving skills on the road using our learner centred approach. Please browse through our driving school website and see below the vast amount of pictures we have showing 'A Class Learners' that have passed their driving test with our skilled driving instructors with their proven methods of teaching driving lessons in Edmonton for success. To take Driving Lessons in Edmonton with our driving school you must hold a valid United Kingdom provisional driving licence to learn to drive in Edmonton. 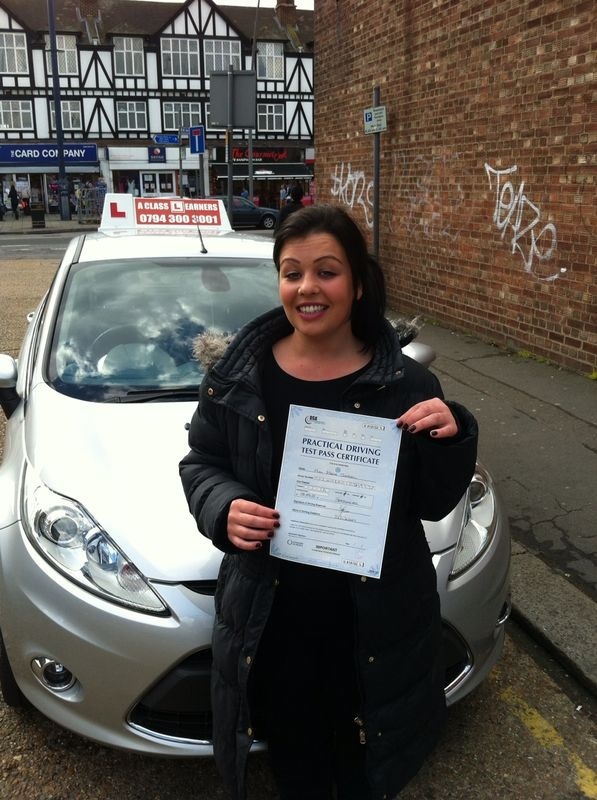 You do not need to have passed your theory test before taking driving lessons with our driving school. 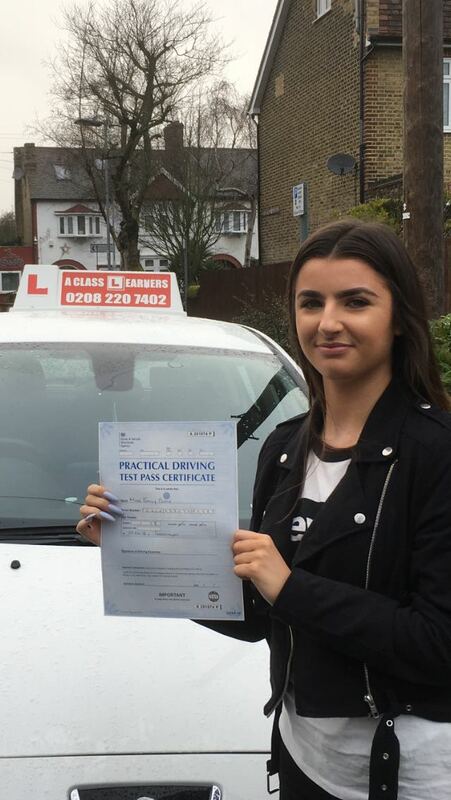 Our driving lessons are also widely available in the local Edmonton London area of, Edmonton Green, Upper Edmonton, Lower Edmonton, Winchmore Hill, Enfield, Wood Green, Mill Hill and more.
" Thank you A Class Learners for helping me to pass first time. A friend recommended me to take driving lessons in Edmonton with A Class. Thank god they did.
" Thank you A Class Learners for helping me to pass my driving test. I was with another driving school claiming they had a 92% pass rate and they were no good. I found A Class Learenrs and found them much better at teaching me. If you need to bring your driving test appointment date to an earlier one than the one you already have, find driving test cancellations with www.shortnoticetests.com. They can get you a driving test date with in a week. If you mention A Class Learners you will be put at the top of their driving test cancellation list. Driving School Edmonton - Are you searching for a driving school in Edmonton? Then search no further. At A Class Learners the driving school in Edmonton we only have fully qualified driving instructors' that teach the new driving test that comes in to effect from the 4th of December. This is what sets us apart from other driving schools' in Edmonton. Our driving school in Edmonton has good pass rates which you can check out on our driving school's Reviews page. A Class Learners driving school has been established for over 25 years and have a strong team of driving instructors providing driving lessons in Edmonton. Driving Instructor Edmonton - Are you searching for driving instructor's in Edmonton? If so we have the very best expert driving instructors' in Edmonton that are highly motivated and skilled to teach you how to drive in Edmonton. A Class Learners driving instructor's in Edmonton have years of experience of teaching Learners' to drive in and around the Edmonton area of North London. We have fully qualified driving instructors' in Edmonton that know all the test routes for your local DVSA practical driving test centres. Our driving instructors offer a veriety of driving lessons in Edmonton and teach both manual and automatic driving lessons in Edmonton London. Take a look below at the different types of driving lessons we teach in Edmonton. Check if driving instructors are fully qualified. You can check this if the driving instructor has a green badge in their car window, if they have a pink one this means that they are not fully qualified. The second thing to look out for is if they have pass pictures. Pictures tell a lot if you have found the right driving instructor in Edmonton. All our driving instructors' in Edmonton are fully qualified and get loads of pass pictures from when their Learners' pass their driving tests. Cheap Driving Lessons Edmonton - We do have cheap driving lessons in Edmonton, but with in fairness limits. What do we mean, 'with in fairness limits' ? Well we are cheap for driving lessons in Edmonton being fair to the driving instructor and what they get paid per hour for tuition. We have calculated that our price matches the same price you would pay to have an hours journey in a cab. Any cheaper the driving instructor would not be able to afford their insurance, car cost, DVSA registration fees, road tax, petrol, learning aids, signage, dual control pedals, mirrors and much more. There are a lot of new driving instructors in Edmonton that have no experience in teaching learner's how to drive and are charging very low prices for lessons to net you in. The fact of the matter you will end up failing and taking extra driving lessons that you will not need. Here at A Class Learners we offer cheap driving lessons in Edmonton for Learner drivers that are searching for cheap driving lessons Edmonton. You can check our prices against other driving schools' in Edmonton and see that for fully qualified driving instructors in Edmonton that know the test routes and have up to date driving instruction vehicles, you can see that we are the cheapest driving lessons in Edmondton offering the key benefits mentioned to you above. Book your Driving Lessons in Edmonton Online today and pay the driving instructor in cash on your first driving lesson. *Please note only one Manual Block Booking offer per person thereafter our normal manual pay as you go rate applies of £21. You can see more reviews here and see how good we really are at teaching driving lessons in Edmonton.